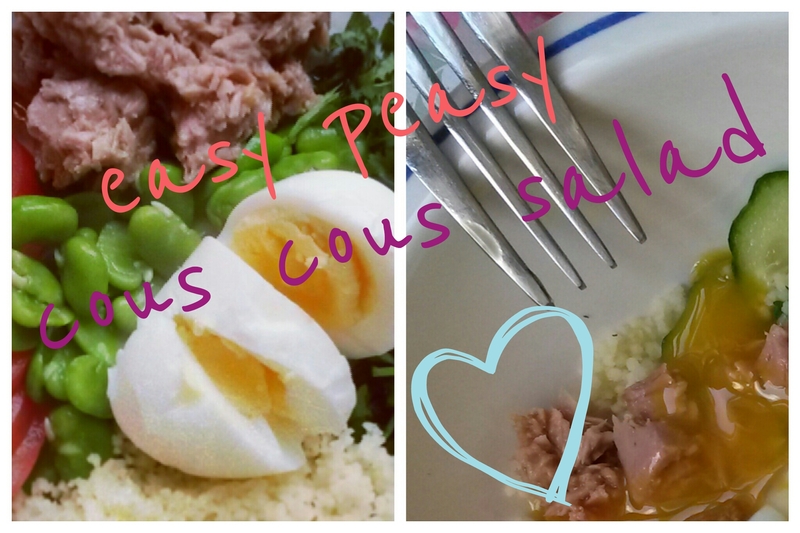 Cous Cous is a such a hassle free carbohydrate to add to a summery salad. I promise if you know how to cook it properly it doesn’t take much effort at all. 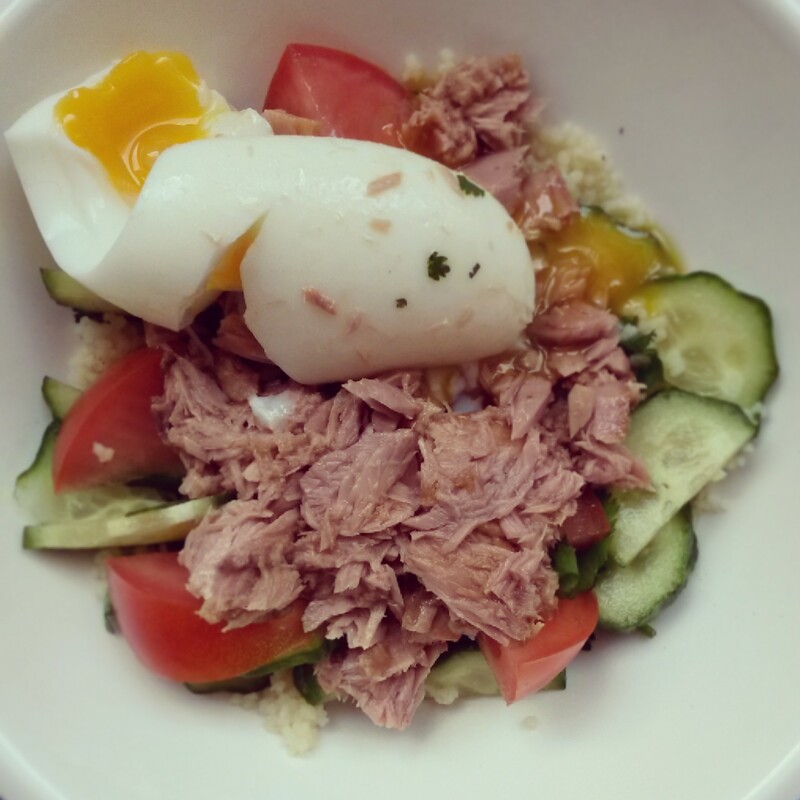 At the weekend I enjoyed a tuna and cous cous salad, two days running in fact because I enjoyed it so much the first time! To start, pop enough cous cous for one into a bowl, remember it fluffs up so you don’t need as much as you think. One small handful is probably enough for a salad (sorry, I weigh things in handfuls!) Once the kettle has boiled pour in just enough water to completely immerse the cous cous and have a thin layer of water sitting on top. Immediately cover the bowl with a plate. If you’re looking for a bit of extra flavour you can also pour in some stock flavoured water, same rules apply. Using the rest of the water put an egg on to boil. Boil it in the shell or poach it if you fancy, however you think will be yummiest. Whilst your egg is cooking and the cous cous is fluffing up, turn your attention to your salad bowl. This recipe couldn’t be simpler. As a general rule I just tend to use up what’s in the fridge. On day 1 it was tomato, cucumber and coriander, and on day 2 I swapped the cucumber for some lovely broad beans. 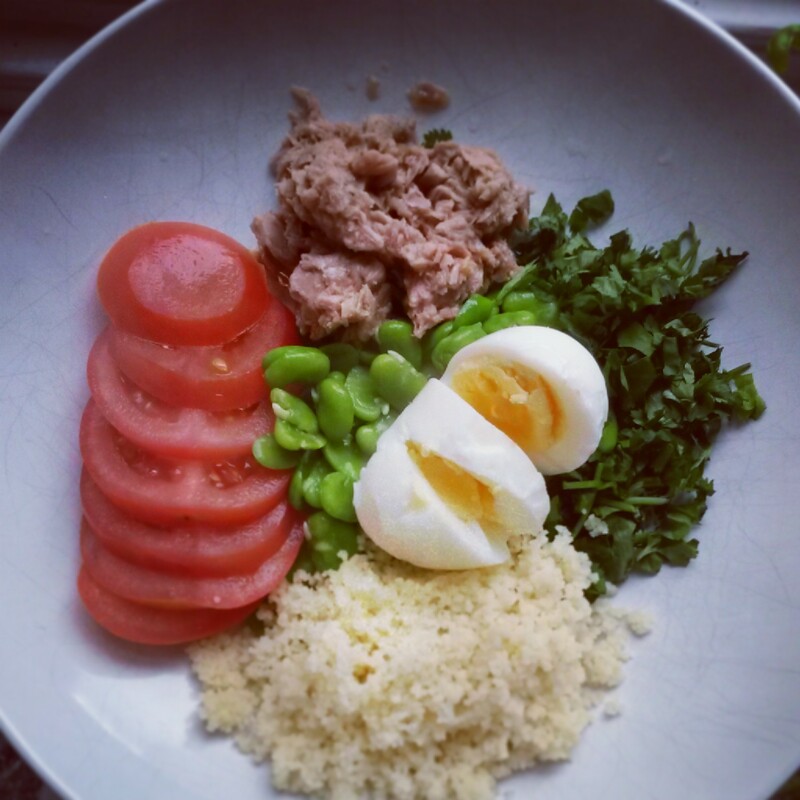 Once you’ve got all your items in your bowl, add half a tin of tuna to your salad bowl – I think you get a lot more flavour if you use tuna in sunflower oil, so don’t drain away all the oil before you add half the can, the oil acts as a bit of a dressing for the salad. Season with salt and paper. After about 10 mins uncover your cous cous. By now all the water have been soaked up and the cous cous should look swollen and dry. Using a fork, fluff it up then add to your salad bowl and then peel your egg if required and pop it on top. Finally, find a comfy spot to sit and enjoy!